Saturday afternoon I was on my way to pay my respects to Bob Reiter’s family who were having a memorial service for him at the fish market and restaurant that bear his name. 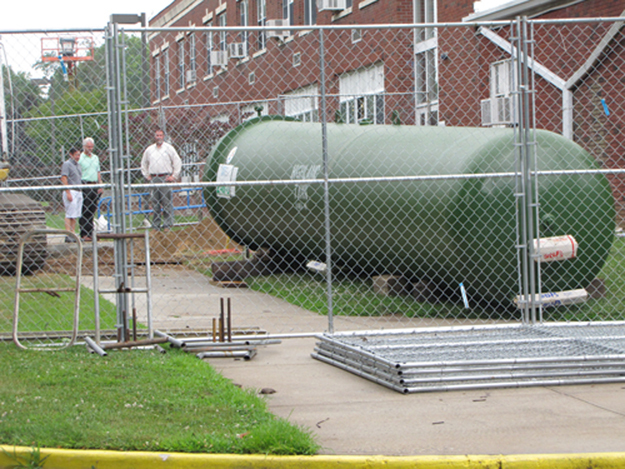 JULIE LANE PHOTO | A new water tank is being readied for installation at Shelter Island School. Work is expected to be completed within two or three weeks, according to Superintendent Michael Hynes. The Shelter Island Board of Education adopted policies at its July 10 meeting related to issues of behavior, dress and language both in the school building, on school property and on buses or at school-related extra-curricular activities. The new standards also prohibit bullying, discrimination, harassment or intimidation. The full policies are posted on the school’s website and are called the Code of Conduct on School Property; the Dignity for All Students Act; and Civility, Citizenship and Character Education/Interpersonal Violence Prevention Education. While there hadn’t been first readings on the policies as is generally the rule, all are routine and were reviewed prior to putting them up for a vote, according to Superintendent Michael Hynes. All had to be in place prior to the start of the school term in September and could be amended in the future if any board member wanted to raise that issue, he said. Work is under way on new windows and a water tank for the building and inside with plans already being implemented for use of space, Dr. Hynes said. The windows should be completed by mid-August. They were part of the project slated for last summer, but time ran out and rather than disrupt school operations, the decision was made to hold off on the installation until this summer. The water tank installation has required turning off water in the building right now and it is expected to be completed within two or three weeks, depending on weather, Dr. Hynes said. Inside, the space previously used for the library has been emptied and is being converted for use as an administrative suite. The library is being moved elsewhere in the building and the first floor space will also accommodate the business office and a separate board room for meetings. Work is also under way to convert rooms to create two academic suites — one devoted to math, science and technology and the other to the humanities. The administrative suite is expected to be functional within a week or two, Dr. Hynes said. He had suggested moving it to the old library space as a security measure since most visitors to the building are bound for that office and now won’t have to walk throughout the rest of the building to reach him. Dr. Hynes also told the board the school needs a “booster club” and agreed to work with board members Tom Graffagnino and Mark Kanarvogel to start one. Board member Linda Eklund pointed out that several years ago, when the district’s budget failed to pass, a booster club was able to raise money to support sports activities that otherwise would have been cancelled. In a cost-saving measure, the board agreed not to join the Nassau-Suffolk School Boards Association at a cost of $2,525. Shelter Island has bypassed the membership for the past couple of years. Board member Elizabeth Melichar said since money wouldn’t be spent on various out-of-town conferences and events in the next year, it might be beneficial to join the organization to attend more local forums. But others said they could still attend those forums at an increased price, but still not as expensive as it would cost for dues. * Lindsay Rando as summer school special education aide for 24 hours, retroactive to July 1 and continuing through July 26. JULIE LANE PHOTO | Mark Kanarvogel seems assured of re-election to the Board of Education, but will there be a write-in candidate joining him or will it fall to the board to appoint someone for a one-year term? 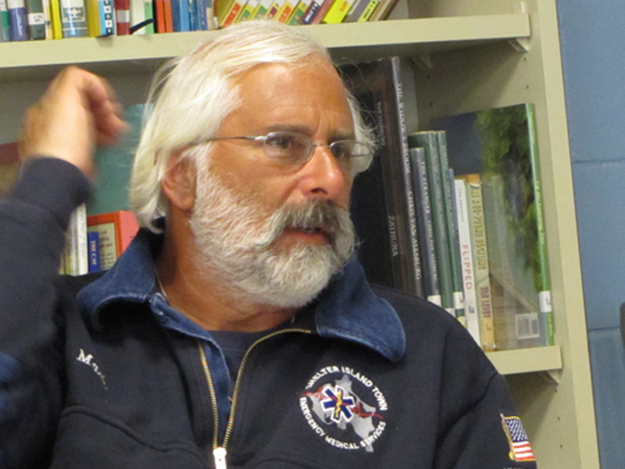 While there are two open seats on the Shelter Island Board of Education, only one name will appear on the ballot — Mark Kanarvogel. Thomas Graffagnino, who has served two three-year terms, has opted not to seek re-election. No one else submitted a petition to seek the seat. Perhaps ironically, board members kicked around the idea of decreasing their numbers from seven to five this spring, but opted not to do so. In any case, such a move would have to be placed on the ballot as a referendum question for voters to decide. Mr. Kanarvogel, 59, has served on the Board of Education for five years. Last May, there were three open seats — two for three-year terms and one that would go to the lowest vote-getter for a one-year term. Mr. Kanarvogel and Dr. Stephen Gessner were both incumbents, but newcomer Marilynn Pysher secured the highest number of votes to win one of the three-year terms while Dr. Gessner placed second, waltzing into the other three-year term. That forced Mr. Kanarvogel to run again this year if he wanted a full three-year term. The lack of opposition secures another term for him barring the unlikely occurrence that there are two write-in candidates, both of whom secure more votes than Mr. Kanarvogel. An announced candidate for a school board seat is required to secure signatures from at least 25 qualified voters to get his or her name on the ballot. But a write-in candidate needs no petition and the two candidates who win the most votes would be eligible to take their seats as of July 1, according to a spokeswoman for the New York State Education Department. She referred to the School Law book published by the New York State School Boards Association and the New York State Bar Association that outlines the law. A write-in vote could put one or even two previously undeclared candidates on the board. But assuming Mr. Kanarvogel wins his seat, and barring a qualified write-in candidate for the second seat, it would fall to the other six board members to select a replacement for Mr. Graffagnino and that person would serve for one year until there is another election in May 2014. The person must be at least 18 and a United States citizen; a district resident for at least one year prior to the election; not be a district employee or reside with any other board member; not hold another public office that would be incompatible with being on the school board; and not have been removed from a school district office within one year prior to being elected or appointed. Should a winning write-in candidate not accept the post, it would again fall to the Board of Education to select someone to serve for a year. Voting takes place Tuesday, May 21, from noon to 9 p.m. at the Shelter Island School gymnasium.